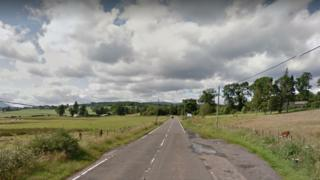 A motorist has been charged with causing injury by dangerous driving following a road accident near Aberfoyle. Three people were badly hurt in the two-vehicle crash which happened on the A81 at about 20:55 on Sunday. Police said a 23-year-old man is expected to appear at Stirling Sheriff Court on Tuesday in connection with the accident. He was driving a blue Kia Venga but he and his passenger were uninjured. The collision near the entrance to the Trossachs Holiday Park near Gartmore also involved a black Peugeot 206. Its driver, a 53-year-old man, and a 56-year-old female passenger were seriously injured in the crash. A second passenger - a 54-year-old woman - is said to be in a critical but stable condition. All three were taken to the Forth Valley Royal Hospital in Larbert for treatment. Sgt David Ross said: "Our inquiries into this collision, which left two people seriously injured and a woman in a critical condition, continue." "As part of this, we'd urge anyone who may have witnessed this collision and has not yet spoken to officers, or who saw either vehicles travelling in the area shortly beforehand, to get in touch as soon as possible."